This is a more powerful version of Medical Calendar, with all of the features of the standard version, but with the additional capability to share data in real time over the Internet. 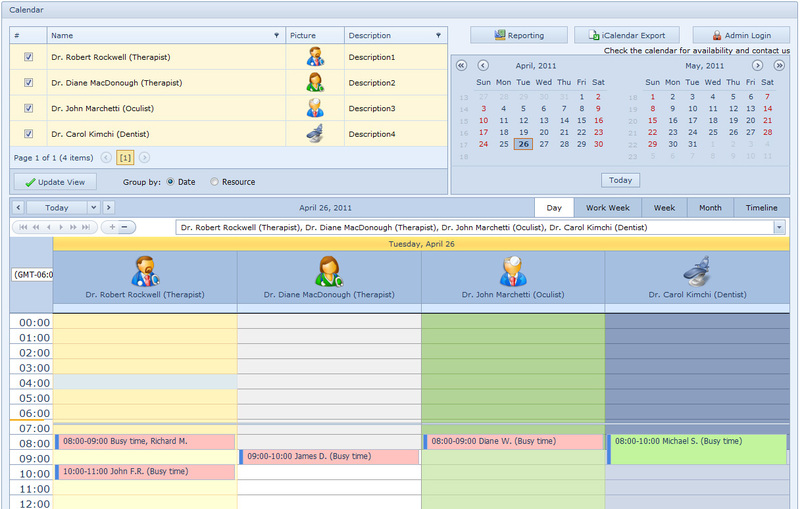 This handy scheduling software will suit perfectly for a single physician as well as for a whole health center. It will help you to quickly create a competently organized schedule for the whole staff. If you want to have your reception hours at hand and don’t want to miss any important job-related events, then Medical Calendar is just what the doctor ordered! Medical Calendar is delivered in a classy interface both intuitive and stylish, making schedule management a piece a cake. Each doctor can create a profile to run his personal schedule. You can instantly switch between profiles to view the schedule of any specialist at any given moment. For your convenience Medical Calendar also allows viewing multiple profiles at a time, to view the schedules of several or even all doctors simultaneously. At any time you can jump to the required date, edit reception hours, patient data,etc. You can change time intervals from a detailed day schedule to a brief quarter overview in order to provide yourself with the most fitting schedule. You may obtain a collection of days which are considered holidays for the specific country, and add these holidays to the scheduler. All information stored in Medical Calendar can be secured with a password preventing from unauthorized access. To safeguard your data, you can also take advantage of the adjustable Auto Backup feature and save the data to the secured archive. Additionally, the schedule can be exported to a variety of formats, exchanging data with other applications (Apple iCal, Microsoft Exchange Server and Android apps) is made easier with the new support for the iCal data format. Thus you can use your schedule in different applications. You pay for the program only the first time and get all new versions of this program for FREE and for a lifetime! Changes: Various internal optimizations and bug-fixes. Minimum requirements: 32 MB of RAM, 7 MB of available hard disk space. SOFTWARE LICENSE AGREEMENT You should carefully read the following terms and conditions prior to using this software. License Agreement ================= This is the End-User License Agreement ("EULA ") is a legal agreement between you ("LICENSEE"), the end-user, and OrgBusiness Software ("OrgBusiness"), the manufacturer and the copyright owner, for the use of the "Medical Calendar for Workgroup" software product ("SOFTWARE").